Knowing the fill-level of an entire container operation and the most cost and resource efficient way to service them has become a reality with the Metro™ series. With ultrasonic and infrared sensing options, and the complimentary OnePlus platform, any waste management operation can become vastly more efficient and cost effective. Using the most advanced ultrasonic sensor technology and digital signal processing, the Metro measures the fill-level of almost any liquid or material in multiple container types. The GPS option enables precise identification of the positioning of your container to as little as 10 metres, adding even greater asset management and security to operations. Although small in size and light in weight, the Metro is rugged and proven in the harshest of environments. Stringent testing and IP67 packaging ensures a reliable and long lasting performance from each sensor. Communicating to the OnePlus platform through low power wide area networks, the Metro uses an internal antenna and reports at configured intervals. The Metro offers a guaranteed 10+ years of reporting based on 10 measurements and one uplink message per day. The Metro is deployed and operational in over 15 countries and monitors many different material and liquid types. Hand held and weighing just .15kg, the Metro is easily installed to containers with one mounting bolt, saving on deployment time and adding monitoring to your operation instantly. 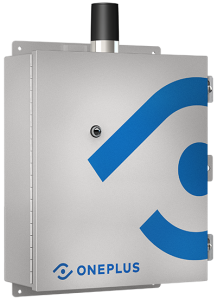 Leveraging the latest IoT communication networks and sensing technology, the Metro™ series of fill-level sensors offer an unmatched standard of urban waste container intelligence. Designed specifically to tackle Smart City waste challenges, the small yet robust Metro™ series has several sensing and mountings options to ensure all manner of waste containers and materials can be wirelessly monitored and collected as efficiently as possible.